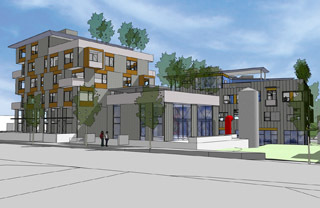 Greenfire Campus in Ballard will promote “sensible” and “social” sustainability. Construction of a five-story apartment building and a slightly shorter commercial building could begin next spring. Construction of an under-the-radar mixed-use project in Ballard should start next spring, says the architect, Ray Johnston. While Johnston laid out the physical plans, he declined to say who's financing the market-rate apartment and office project between Northwest 56th and 57th streets and 20th and 22nd avenues. He said the group is made up of people who hold the ideas of sustainability “very dear.” Unlike many developers, who build in hopes of making a profit in five or so years, Greenfire members see this project as a long-term, multi-generational investment. The Seneca Group is the project manager, and Walsh Construction is the contractor. Other team members are Robin Chell Design, interiors; The Watershed Co., landscape architecture; WSP Flack + Kurtz, mechanical, electrical and plumbing engineering; 2020 Engineering, civil; and DCI Engineers, structural. Johnston said the cost of the project, which is scheduled to take about a year to build, has not been fully calculated and declined to give an estimate. The two buildings will be about 18,000 square feet each. That's smaller than what a previous owner had planned for the site that is east of the Ballard Library and a block north of Swedish Medical Center. Schnitzer West planned 157 units of housing. Zoning allows heights up to 65 feet. Greenfire's apartment building will be five stories with 18 units and the commercial building will be three and a half stories. The smaller buildings will allow for more green space. That's where the social sustainability part of the project comes in. Gardens and open space “make people want to be there and enhance social interaction,” Johnston said. Food will be grown on the edge of campus. Produce could go to restaurants and passersby would be drawn in by the chance to pick, say, blueberries. The apartment on the north side of the site will have a P Patch for residents. The center of campus will be more natural and habitat-driven. It will be a mix of forest and meadow with native plants. There will also be rain gardens. The campus will have a ground source heat pump, well-insulated buildings with a lot of natural ventilation, green roofs, solar energy and hot water, and rainwater collection and gray-water recycling. Parking will meet the city's code and will have electric-car charging stations. There will be a lot of bicycle parking, and the neighborhood that already is well served by transit is going to get more next year when Metro starts its bus-rapid transit service, RapidRide. The D-Line will run from Crown Hill to downtown via Ballard and Uptown. Office seems like an odd use for Ballard, which has become increasingly residential with more big new multifamily projects. The Greenfire team is including office to provide more opportunity for people to work near home. The first floor of the commercial building could be retail, Johnston said. Office and retail, if successful, will bring more life to the area during work hours. Years ago when a project like this was introduced, it would have been heralded as aiming for LEED gold. The Greenfire team took a different tack. The team weighed whether to pay the administrative fees to get the LEED plaque. Backers are more concerned about developing a project that will be the genesis of an eco district than getting the green stamp of approval. But because team members are working to demonstrate that this kind of development is feasible, they probably will go through the certification process.